Right now, the rovers have limited view of their surroundings, low to the ground as they are, and have to depend on crafts orbiting the planet to provide directions and ideas of what lies ahead. 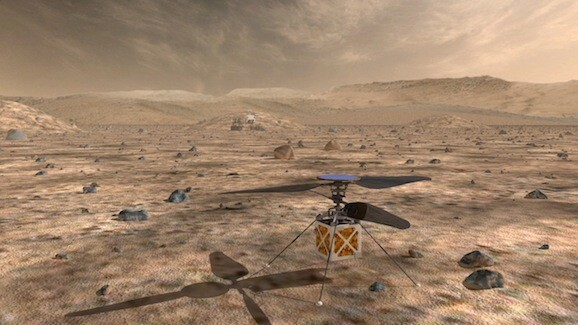 A machine such as a Mars Helicopter could essentially serve as an advanced scout and help increase the efficiency of the mission. As proposed, it would fly ahead of the rover each day and survey the landscape. This would allow the engineers back on Earth to plot out the best route so as not to run into any dead ends or other delays, and also to check in on spots of interest to the research team. If this eye in the sky spies an unusual feature, or somewhere the observers might want to collect samples, the controllers can add it to the itinerary in advance. In addition, it could allow them to search out intriguing possibilities and explore a wider area. Such assistance could allow the rovers to cover as much as three times more distance in the course of a Martian day. The latest proof-of-concept design of the Mars Helicopter is currently at NASA’s Jet Propulsion Laboratory in Pasadena, California, where it has undergone tests and staged demonstrations. Ultimately, the device is visualized as cube, roughly the size of a tissue box, with a blade span of 3.6 feet (1.1 meters) and a weight of around 2.2 pounds (1 kilogram). This could be our best bet for exploring as much of the Martian surface as possible before actually putting actual feet down on the ground.